St. Patrick's Day is Saturday. Are you all ready?? I don't drink or celebrate in the typical way. I think getting completely inebriated and not remembering your nights is a lame way to spend your time and money. I prefer spending my money on nail polish :). To each their own though. If that's what you enjoy doing, I hope you have a SAFE day!!! So to celebrate the holiday and my heritage, what better way than to design cute nail art? Originally, I was going to do the buckle/hat thing on all my nails, but then I really really wanted to do leprechaun faces. I started thinking how I could manage to do so, then I remembered the Santa nails I did around Christmas time (should i post these?). They were little faces with beards and eyes. I found myself looking at pictures of leprechauns and figured out a way to copy their faces. For the faces, I painted a base coat of Zoya Avery. This polish is a perfect skin toned polish. I painted it on on all my nails one day and it kind of freaked me out it looked so similar! I then took a piece of scotch tape and covered majority of my nail to add the green hat. Then I took my dotting tool, and with Zoya Lianne dotted the beard and hair. Next came the details of the eyes, nose, mouth, and buckles with some tooth picks. The rest of the nails were simple. A quick base coat of Sold Out Arena, then dotting of the black line, and tooth picked a buckle in white, then overlapped it with gold. Slapped on a top coat and done! 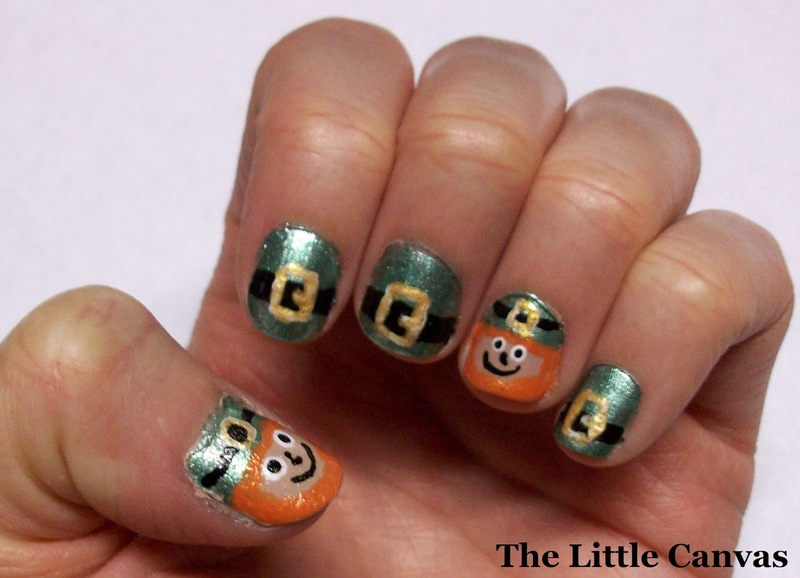 Easy, simple, and ready for St. Patrick's Day! Tomorrow the little guys will be coming off and another cute design will be coming!!! Haha such a cute manicure!